We already have a very nice Doom 3 thread, so why not start another one for Q3A? Back in the day it was the top game to use for GPU benchmarks. Q3A launched at the end of 1999 and the last (official) patch 1.32 was released sometime in 2002 I think. So I've prepared four period-correct rankings for years 1999-2002 - each split in two parts. CPU & GPU period correct must use CPU + GPU + chipset launched before December 31st of that year. I did some research and (most) of the allowed hardware is written at the start of each category. GPU period-correct (my favorite ) only limits the GPU, you are free to use any CPU and MB you want. You can use any official Q3A version. Version 1.11 or demo 1.11 is reccommended though. https://www.fileplanet.com/34621/downlo ... Arena-Demo Just type "timedemo 1" in the console and then run demo001. Last edited by havli on 2017-8-03 @ 17:07, edited 5 times in total. How far into the future you want to go with 2002+ ? I think difference between trilinear and bilinear on GeForce FX is so small it doesn't matter. Even on my GF2 Ultra its impact is rather low 144 fps (bilinear) vs 133 fps (trilinear). 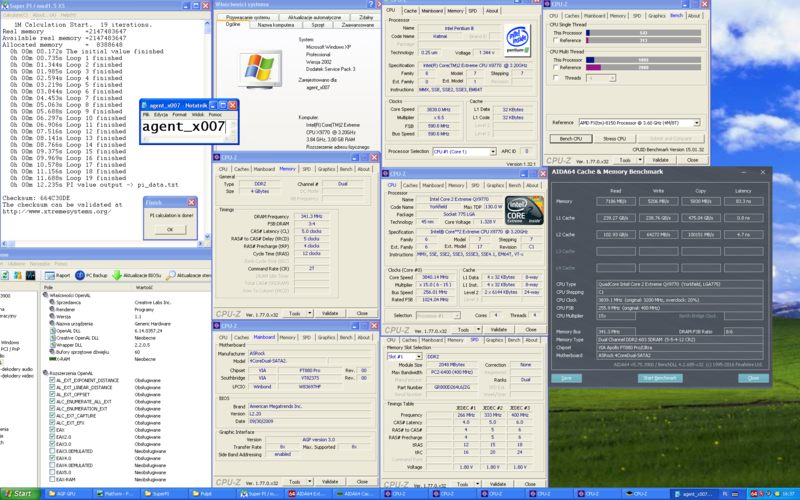 2002+ is not limited... so if you have Titan Xp and Skylake-X score feel free to use it. After 2002 I guess it is a CPU benchmark anyway, 4.8 GHz 7700K + GTX 1070 are doing 986 fps for example. It is similar to the "Anything goes toplist." in the Doom 3 thread. Q : Why Fullscreen On ? You can't screenshot result in Fullscreen (and even taking picture off score itself is pointless since you can't see PC settings). ad fullscreen - force of habit... I never play in windowed mode. I don't know, isn't it slower than FS? Anyway for the rankings here windowed mode is perfectly acceptable. 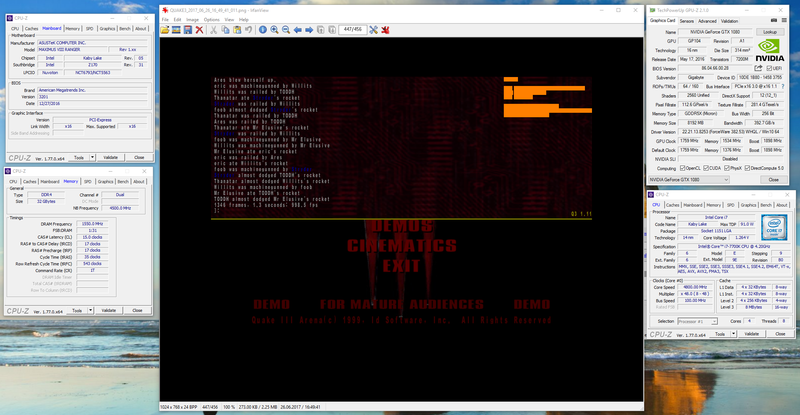 Yeah, the screenshot is more or less "useful" as the Doom 3 screenshot, show only the score and nothing more. 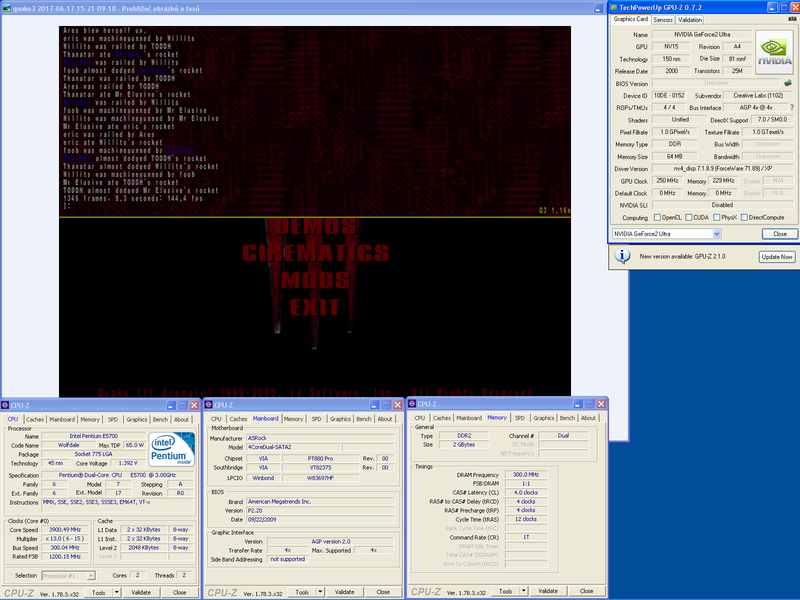 It is possible to do screenshot using Fraps or similar SW. Or use windowed mode and printscreen. 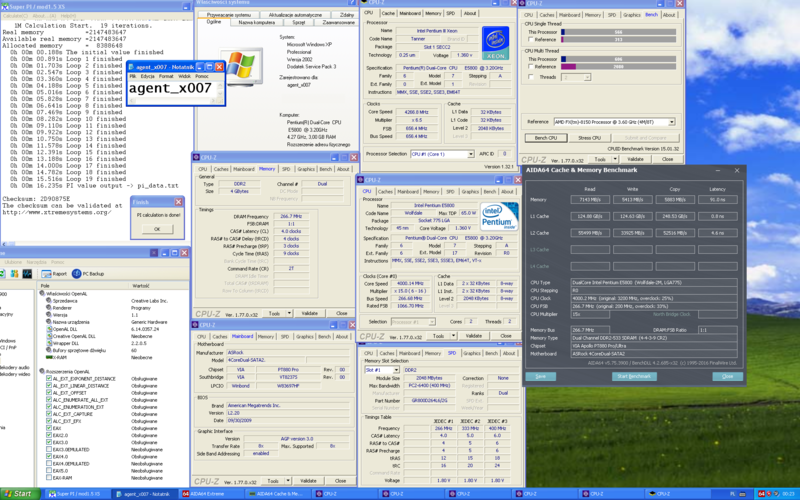 Btw - I see you also performed the BSEL mod on your 4CoreDual-SATA2, it really helps the memory performance to run 1:1. First one was for E5800 only (since QX9770 has unlocked multi) and second for both. Gonna love that VRM and locked BIOS. havli wrote: You can use any Q3A version, even the demo is fine. I think this game is frame capped or something. I ran timedemo1 on my three fastest systems. i7-4930K @ 4.5GHz - GTX970 overclocked to GTX980. All three of them were doing 980-985fps. The entire timedemo just zips by in like a second, which might be why it can't seem to go any faster than 985 fps. Might be time to benchmark some slower systems. Good point, added this to the OP and also link to the demo version. Yeah, mine board is doing the VID mod by itself... probably has something to do with the damaged LGA socket. Lucky coincidence. Btw - you still have a room for improvement when it comes to RAM bandwidth. Standard Def Steve wrote: I think this game is frame capped or something. Does the period correct hardware mean all stock (non-OC)? Both overclocked and stock are ok to use. I'll mark the overclocked scores italic just for reference, but both belong in the same ranking. All right, here are a few. All of these were tested at the recommended 1024x768/max. The Voodoo3 was tested with 16 bit color. 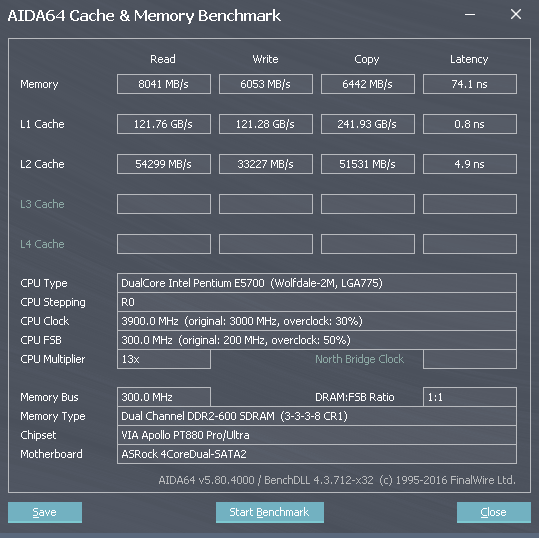 EDIT: Added a benchmark result for the Yonah processor. Last edited by Standard Def Steve on 2017-6-24 @ 20:51, edited 2 times in total. Began to wonder why on earth my system were faster than a Pentium E5700 @ 3.9 GHz with the same graphic card, looks like I modified the clocks in the BIOS many years ago. Tried r_smp 1 but I then had worse FPS. What is the reason for using bilinear filtering? Kamerat wrote: Began to wonder why on earth my system were faster than a Pentium E5700 @ 3.9 GHz with the same graphic card, looks like I modified the clocks in the BIOS many years ago. Tried r_smp 1 but I then had worse FPS. heh. Gaming at 1600x1200 in 2001. Poor console users. Thank you for the links DosFreak. That's exactly what I thought, but at the specified resolution, the exemplified card is already excluded... mostly. Bilinear is for compatibility reasons for older GPUs as leileilol said... and with newer ones, the performance his is so small it makes no difference. Updated OP and added GTX 1080 + 7700K score, yay - first place.